The “Stay on” app is almost out of the testing phase, time to publish the working of the app: enter the manual. So what is the purpose of the app? The purpose of the app is to easily extend the screen timeout. 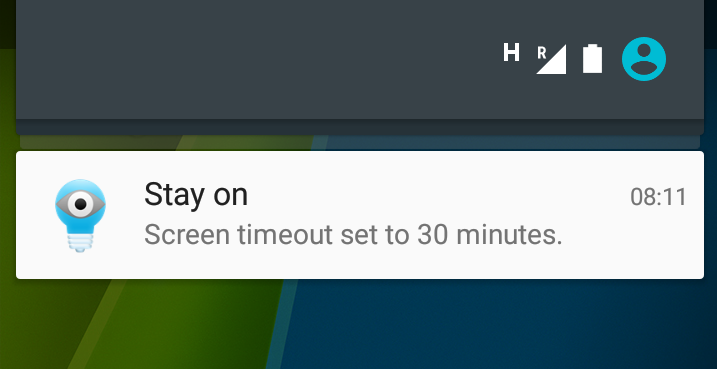 When you click the icon, it will remember your current screen timeout, and then set the screen time out to 30 minutes. That was all to extend the screen timeout. I don’t see a app screen or form? That’s correct. Because there is no interaction with this app there is no visual screen or form. You only see the “toast messsage” and the notification. Typical usage for the app is that you only want to extend it for a limited time of use, so you want to reset the screen timeout to the old value too. 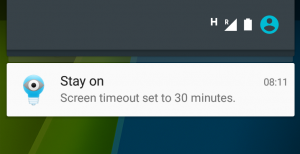 In both cases the screen timeout will be set to the old value (which we remembered earlier) and you get a short “toast message” what the new screen timeout is. Hope you enjoy the app, and if you have any questions please post a comment.